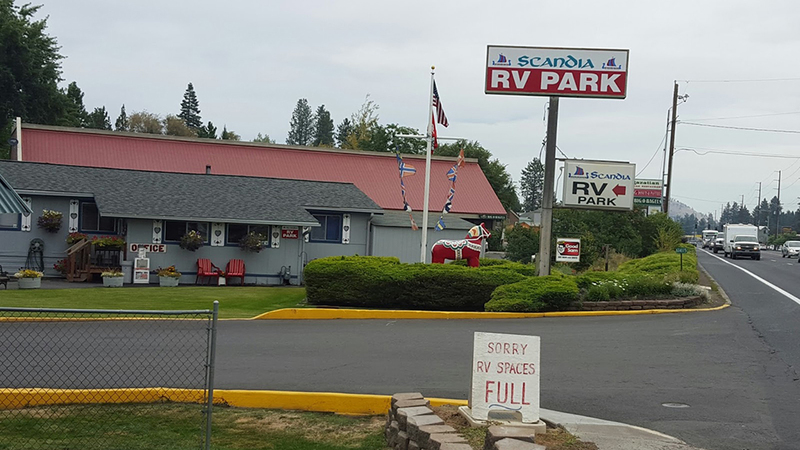 Scandia RV Park offers an oasis in the middle of Bend at the south end. Plush green grass and trees provide the perfect setting to fire up the BBQ and relax, or tour many area attractions. If you prefer to take the night off from cooking, there are quite a few choices within just a short walk of the park. Scandia is family owned and they welcome you as “family” whether for a one-night stay or much longer. Deanna and Richard, their on-site managers, provide the personal touch to make you feel welcome from the dog treats to Deanna’s candy dish and Richard’s fresh morning coffee. Their 60 sites are full almost every night in June, July, August, and early September, so they strongly recommend you call ahead for reservations to enjoy one of their large sites including many pull-throughs. Their sites include full hook-ups with cable TV and WIFI.